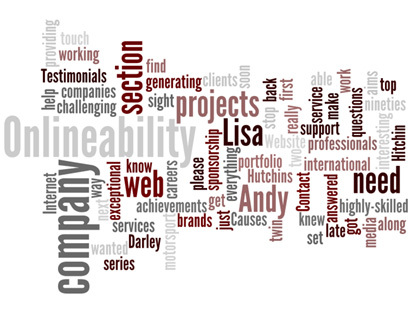 Onlineability is the company of Andy Darley and Lisa Hutchins, two highly-skilled web professionals who knew, as soon as they got their first sight of the Internet back in the late nineties, that it was where they wanted to make their careers. And they did just that, working for a series of top international brands and media companies along the way. Their next stop was to set up Onlineability with the twin aims of generating interesting and challenging projects to work on and providing exceptional service to clients who need help with their web projects. In this section you should be able to find everything you need to know about them and the company. If you have any questions that aren’t answered, please get in touch. Or follow Onlineability on LinkedIn here.